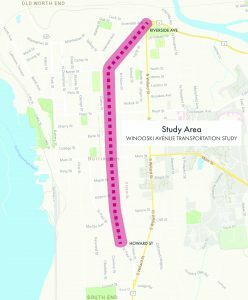 This is a transportation corridor study of the entire Winooski Avenue corridor as the City of Burlington looks to create multimodal, Complete Street routes throughout the city. The final plan, to be completed by Fall 2019, will provide recommendations to address safety, capacity, and connectivity for all modes of transportation along this important north-south connection. Implementation of proposed recommendations will be determined as part of the City’s future capital plan. 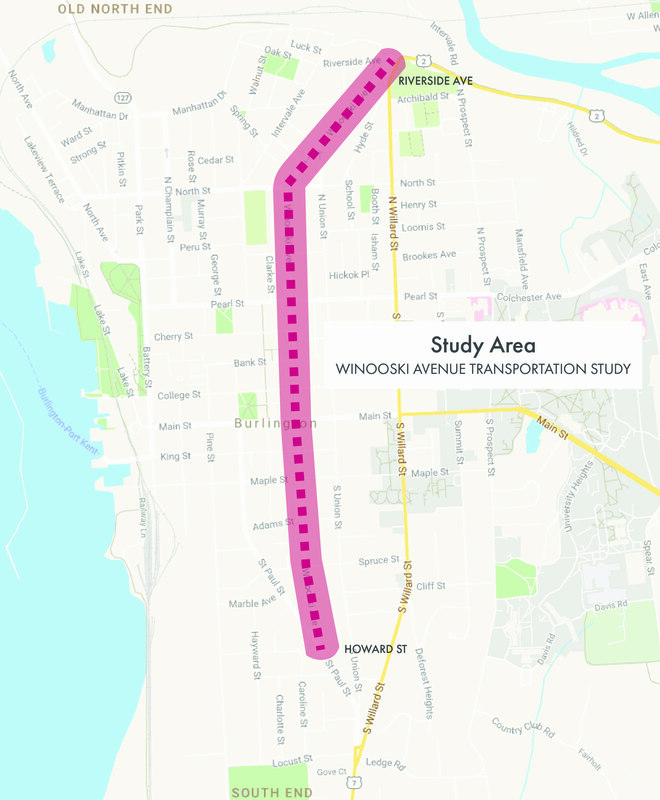 The study area is along Winooski Avenue from the intersection with Riverside Avenue to the intersection of Howard Street (at St. Paul Street). The study may also consider the corridor’s relationship with Union Street, Willard Street, and cross streets as appropriate. Previous technical analysis of Winooski Avenue (and consequently Union Street), using a traffic microsimulation model, provided understanding of the traffic implications associated with five alternative traffic reconfigurations. Of the five alternative traffic patterns analyzed, Complete Streets improvements serving all modes on Winooski Avenue would be the least disruptive to vehicle traffic while still providing a full north-south bicycle corridor along Winooski Avenue. Results from the technical analysis will inform the current corridor study. The corridor study is a comprehensive transportation study of the entire Winooski Avenue corridor, developing multimodal improvement strategies that address safety, capacity and connectivity. It will include a broad public participation process and follow the guidance established in PlanBTV Downtown and Waterfront, PlanBTV Walk/Bike, and Burlington’s Transportation Plan. Winooski Avenue is home to small businesses, community spaces, New American populations, college student off-campus housing, business services, and more, and it is a connecting route for people traveling around the City and beyond. The project team will do its best to conduct this study in a way that involves and considers this unique diversity of stakeholders and contexts. All meetings and public participation opportunities will be listed here when scheduled. Want to join the project email list to stay up to date on progress and meetings? Contact Bryan Davis, CCRPC Senior Transportation Planner, at (802) 861-0129. The project’s Public Participation Plan describes how members of the public will be involved throughout this project. The public involvement process will be informed by the CCRPC’s Public Participation Plan and the City of Burlington Public Works’ Public Engagement Plan. The role of the Project Advisory Committee (PAC) is to represent a range of perspectives; review study materials and provide feedback; communicate with and provide updates to their organizations/constituents; and participate in developing the purpose and need statement, alternatives, and recommendations. Ultimately, the City Council will consider and endorse the final recommendations of the Study. This meeting provided an introduction to the project, the roles/responsibilities of PAC members, project timeline, an overview of previous related studies, and discussion about the draft public involvement plan. The project team presented an overview of existing conditions along the corridor including current facilities, traffic volumes and patterns, safety and crashes, parking demand and more, as well as a preliminary discussion of which 6 facilities/segments to examine in further detail. This meeting included an overview of corridor stakeholder interviews, an update on the draft Existing Conditions report, discussion of the 6 segments for which alternatives will be developed, and discussion of the draft corridor vision and objectives. This was an extra PAC meeting added to the project to provide an initial review of early concepts to ensure they are aligned with previous public input and guided by previous PAC meetings. These initial concepts will be refined based on discussion from this meeting, reviewed at PAC meeting #5, then presented to the public for review and feedback. The PAC will review and discuss the first draft of the corridor concepts, and provide input on the proposed public engagement activities to share these broadly with the community throughout April and early May. Documents will be added here as they become available. For more information, please contact Bryan Davis, CCRPC Senior Transportation Planner, at (802) 861-0129.